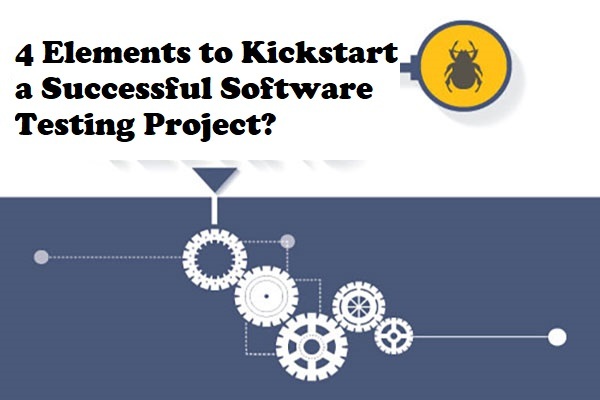 4 Elements to Kickstart a Successful Software Testing Project? Software testing is a process of executing a software application or program with the intent of finding software bugs (errors or other defects), and verifying that the software product is fit for use. Software testing industry is growing like never since more and more software engineers start to take part in this industry. Yet, is a testing project all about debugging? Or it does need more than that to carry out a successful software testing project? Let’s check out four essentials to run an effective software testing project! When it comes to testing strategy, it is about the type of testing, while a testing plan is made for your organizational purposes, the order in which to perform them, and the optimum amount of effort to make your testing effective. The strategy is decided on the basis or requirements and information that help on finding the customer’s focus. When you’re getting down to your first test strategy, you should focus on any features you consider as the most significant. If you’re doing this for a client, you must confirm with them which is the most important. If you’re testing your own program, you’ll find there’s way too much to test or you do not know where to begin. Sit back, take a deep breath and try to prioritize your most important elements. On the other hand, a test plan is where you lay out what’s being tested, for how long, and by whom. On your testing plan, you need to not just lay out what is being tested, but also it’s necessary to understand the effect of one testing step on its next one. This way you won’t run into any surprises during your testing. Your test strategy and test plan are necessary documents. You will be continually updating them as you discover new bugs and keep track of your testing project. Without a proper test strategy, you’ll end up wasting the majority of your time on your testing project with minimal results. Test environment refers to the place where testing is done and consists of elements that support test execution with software, hardware and network configured. When we talk about the test environment, we try to set up a sample environment that reflects the environment where the software will actually run in the future. As important as the test environment is a test case. A test case is a set of conditions or variables under which a tester will determine whether a system under test satisfies requirements or works correctly. When you run your test cases, you realize that some functions in your system have been changed and now your test cases become out-of-date. Now you need to go back to your test cases, modify to make them up-to-date and run them. It’s not a big deal if the change is minor and there are just a few test cases need to be updated. The process of developing test cases can also help find problems in the requirements or design of an application. A test tool is basically a tool that can run tests. Nowadays we can get a wide range of software testing tools in the market. To decide which tool is the most suitable is totally based on the project requirements & commercial (Proprietary/Commercial tools) or free tools (Open Source Tools) you are interested in. It is obvious that free testing tools may have some limitation in the features list of the product, so it totally depends on what are you looking for & is that your requirement fulfills in a free version or upgrade your software testing tools to premium. There are several testing tools offered by different software developing companies. These tools provide automated functional and performance testing for environments including Java, SOAP, CORBA, HTML, WAP, client/server, UNIX, and Windows. Nowadays, many software development companies prefer cloud-based in order to secure the information of their user. The cloud may not always stable enough to sustain a variety of tests. You cannot run tests on real user’s data and the cloud is such vulnerable, so it’s important to build a set of test data. The test data can be anything like sets of names, addresses, mobile phone number, product orders, or whatever information relevant to your application and program. In your tests, you’ll be continuously creating, updating, and deleting data until all of the flaws are fixed. A set of test data, in this case, can be altered over again to make sure each one of your functions is working while the real user’s information remains secure. Test data development is often carried out simultaneously with test case development. Teamwork has always been a crucial issue when it comes to a project requiring different participants. A team leader should keep in mind each member’s strength and weakness to get the most out of your testing software project. The daily meeting is also considered a must so that everyone can keep track of workflow, give feedback and review about other’s tasks. Frequent communication between every member of the team, on the other hand, enhances the productivity of the whole project as each member feels free to share their difficulties and is willing to receive feedback from others. As a result, productivity is steadily increased and the software testing project hits the goal sooner.